I like bows. Eleanor doesn't. She wears them for about 45 seconds. During which, I snapped this photo of her. This was on her birthday. 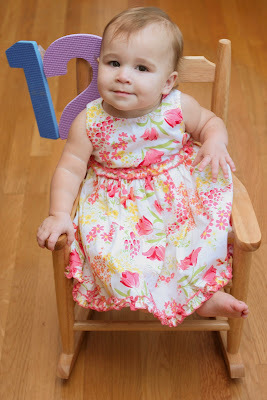 I think she looks like the perfect little birthday baby. If she only knew how cute she looked with the bow in! 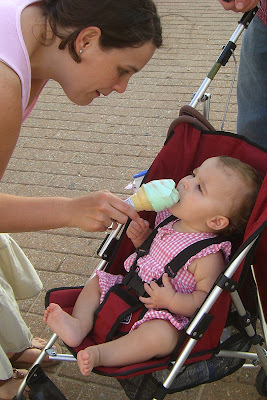 Somehow, I have become the mommy of a one-year-old. Wow. Here she is. The photo is sort of anticlimactic. I was hoping the last one would be really great, but Eleanor was feeling a bit like a little crabcake for the photo shoot, and I refused to subject both of us to another one. Still, she looks quite adorable, and I'm just lucky she's not blurry. Man, one-year-olds can really move! Eating everything we eat. From her own plate. With her own fork. When she wants to. End of discussion. Saying lots of words. The current favorite is "Uh-oh." There have been lots of on-purpose drops just so she can excitedly exclaim her new favorite saying. She also says, "Momma", "Dadd-yyyyy", "cat", "duck", "ball", "book", "up". She says "hi", but only in a whisper voice. So funny. And some party tricks- blowing kisses, waving, clapping, etc. You know the ones I'm talking about. We went in for her one-year check-up. She kept dropping her pacie and exclaiming, "Uh-oh!" until the doctor acknowledged her. When he did, she clapped wildly for herself. That kid. She also now realizes that the doctor's office is the doctor's office, and screamed like a maniac as soon as she heard the nurse's voice. What a good memory! She weighs 20lbs., 12oz. (50th %-ile) and is 28 3/4 inches tall (25th %-ile). So Eleanor's first birthday party is officially done. (Sigh). I think it was a success. Everyone seemed to have a really good time. Eleanor especially enjoyed the cake-eating and swimming portions of the event. By the time we got around to present-opening, she was one tired little cookie (and was probably coming down off a mean sugar buzz). I have already had several inquiries as to the whereabouts of these birthday party photos. So, here they are...the long-awaited (seriously, people, it was yesterday) photos from the par-tay. There is even a bonus photo of Eleanor doing her latest trick- blowing a kiss. Jessica tagged me for a meme! I thought I had already done this one, but turns out it was just six weird things, so I'm sure there are at least eight more random things to let you in on. Number one: I LOVE rules. I wouldn't know what to do without them. No one would. I have given up on pointing out to others when they aren't following the rules, though. Not a single person ever thanked me for showing them the error of their ways. Number two: I also LOVE (it's more serious when it's all caps) bulleted lists. (The non-bulleted version will do if and when bullets aren't available.) Very direct. Very efficient. Very bullet-y. Number three: I like making up words...like bullet-y. Number five: I was on one of those makeover TV shows once. It was called Ambush Makeover. The reruns still come on the Style Network, so you should tune in if you want to see me look like a total idiot with blonde hair and an obscene amount of make-up. Seriously, I was probably responsible for the deaths of an entire family of whales that day. Number eight: I was the Prom Queen. And Jared was the King. And you will never see a picture. I'm not tagging anyone (wait, is that against the rules??) because I'm pretty sure all of my blogging friends have done this already. If you haven't, feel free to do it, but please leave a comment letting us know, so we can check it out. Here are a couple of pictures of Eleanor just hanging out in the living room. I was actually trying to capture her adorable, little curls, but I don't think you can see them very well. 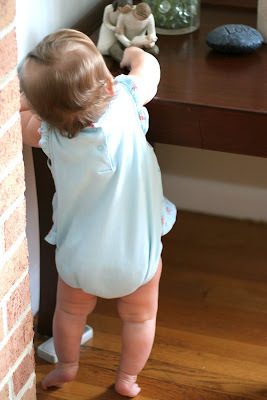 She has made it her mission in life to get those Willowtree figurines from that corner table. She knows she's not supposed to, but I think that's what makes it so fun for her. As she heads over there, she turns and looks to make sure we know what she's up to. Is it normal at this age that she thinks 'no' is some fun game Mommy plays?? It's like she's testing me to make sure I'll say it. Yesterday, when I kept moving the figurines out of her reach, she discovered that shaking the table would cause them to move (or fall over), so that she could get them. Smart. But annoying. Anyway, I couldn't decide between the color and black and white of the first one. I thought the highlights in her hair looked really pretty in the b&w one. Wild. I'm so sure. We did stay up until 10:45. So, my friend Laura and I had a B-L-A-S-T at the beach!! It was great to get away, but I gotta admit that everything I saw reminded me of (and made me miss) Eleanor. 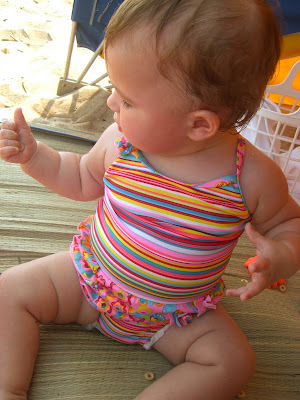 This adorable baby at the beach had the same little striped swimsuit that Eleanor has, and every time I looked at her I felt terrible about leaving my own baby at home. Okay, maybe terrible is an exaggeration- I did miss her, though. We relaxed at the beach all day Saturday. I didn't even read the magazine I brought because I didn't want to expend that much energy. I just laid there like a big slug soaking up the rays. Well, I would have except for the fact that I very responsibly bought SPF 50 sunscreen. I wanted to relax- not cook like a lobster. Then, that night, we ate at a really yummy restaurant. It was a seafood restaurant, and I hate seafood, but it was yummy nonetheless. I even ventured out, which is so not like me (did you catch the part about SPF 50? ), and ate shark. It was the special appetizer of the night, and Laura thought it sounded good, so we ordered it. It was pretty darn tasty. I liked the outside the best- the part that wasn't fish. We also had the best dessert ever. Ever. Seriously. It was warm chocolate cake smothered in some delicious something-or-other. Mmmm. 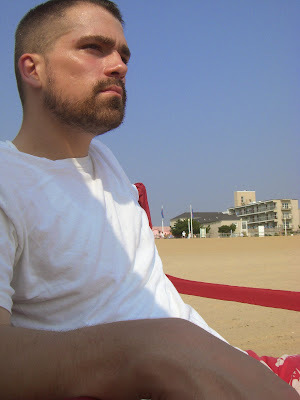 Here are some pictures of us enjoying the beach. The little tyke is Laura's 2-month-old Cyrus, who did not want to be apart from his mommy for the weekend. We were so glad he joined us- you can't just have two women goin' off alone without the protection of a strapping young man. We had a great time at the beach...pictures coming soon. In the meantime, here is a picture of Eleanor that I found on my diaper bag camera from her first trip to Burger King. (I love when I forget to download the pictures from there, and find gems like this weeks and months later!) She was oh-so thrilled that I kept putting the little cardboard crown on her head. Okay, so riveting this post is not. Mostly just a little random. 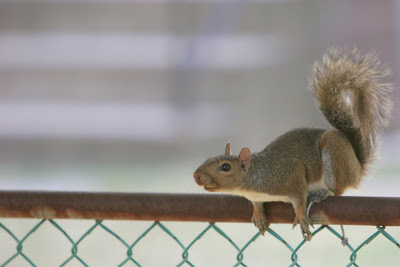 We have a squirrel that lives in our backyard. 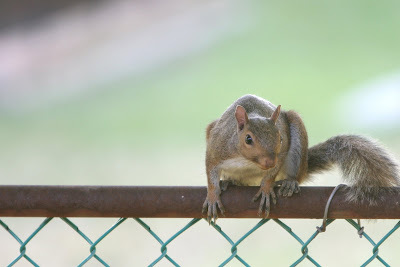 He takes naps on the fence (I guess he's napping- do squirrels sleep with their eyes open?? ), and plays in the trees. I don't know yet whether or not he has a family, but baby squirrels would be really cute, right? Why haven't I ever seen a baby squirrel? They must be really little. 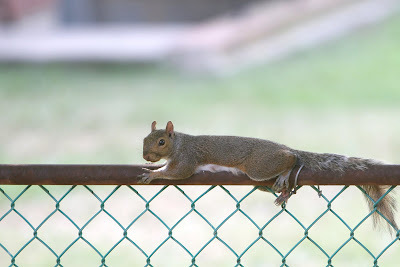 Anyway, here are some pictures of our squirrel hanging out in the yard. In the last one, he's trying to get away from the weird lady with the camera by jumping into the tree. Whatever. It's my yard, and I'll take his picture whenever I want. In other (surely more exciting) news, I'm going back to the beach tomorrow. Not we. I. And my friend Laura. We're leaving the kiddos with their very capable daddies, and heading down to have some girl time. We're going to spend the night, and come back on Sunday. I've never been away from Eleanor overnight (or for more than three hours), so I'm a little nervous. I'm excited...did I mention nervous? I can't wait to lie on the beach and relax while reading a magazine and listening to the calming sound of the ocean...I hope I'm not too nervous to relax. Woohoo!...Virginia Beach, here we come (yikes)! 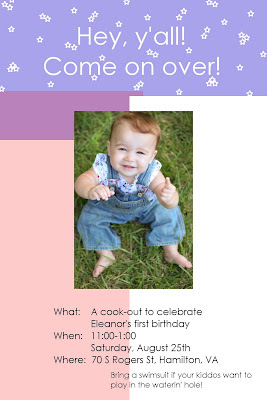 So, here is Eleanor's first birthday invitation. Unfortunately, colors that were blue and red in one program, were purple and pink in another. So, when I had them printed (and obviously when I uploaded it to Blogger), it looked very cute and girly, but not that Texas-y. I still love it, and really the focus is on that adorable little punkin' in the middle anyway! Here's the full-size invititation photo. So, I decided that Eleanor needed to learn a new trick for her upcoming birthday party. I started working now because I thought it would take a couple of weeks for her to perfect it. Little did I know, she would catch on the first day! What a smart, little cookie! 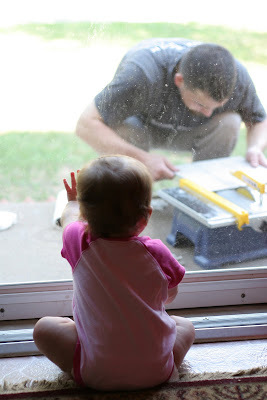 Here are a couple of pictures of Eleanor watching her Daddy working on today's home improvement project (laying tile in the bathroom). 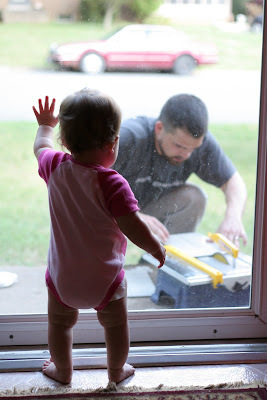 She watched with Baby Einstein-like intensity, and would occasionally knock to make sure he knew she was there. It was such a precious moment (I mean, hour). 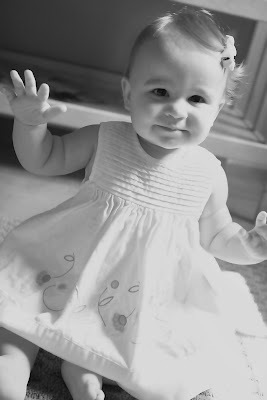 So, this morning we had the photo shoot for Eleanor's birthday invitations. We're doing a Texas-style cookout, which is probably cheesy since we don't live in Texas, but almost everyone who's coming has lived in Texas, so I thought it would be fun. 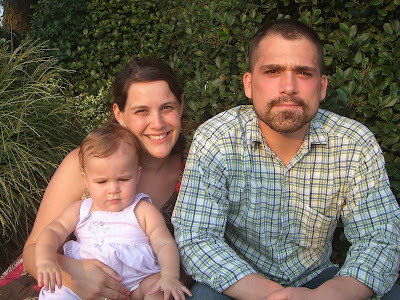 (That one, long rambling sentence was designed to convince you and me both that the Texas party will be cute.) Anyway, I threw on Eleanor's new Osh-Kosh overalls and plopped her in the grass and started shooting away. Here are some of the ones that I didn't choose for the invitation. I'll post the invitation after I've mailed them. 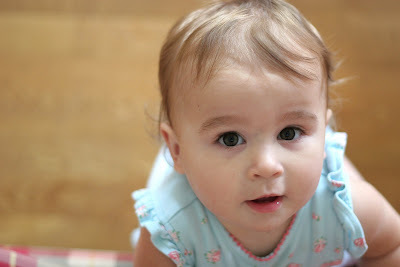 I know I'm the mom and this might be bragging, but how stinkin' cute is my kid?! I just can't get enough of that girl!! My mother-in-law (Eleanor's Mimi) just left this morning after spending two weeks with us. (We're both very sad already.) 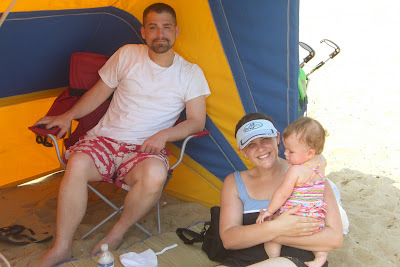 This past weekend, we all took a little trip down to Virginia Beach. 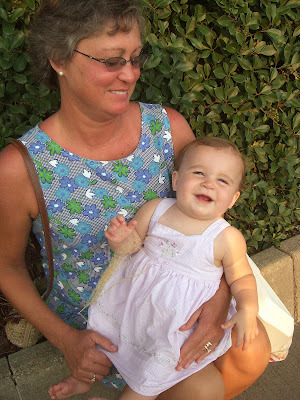 My mother-in-law (okay, she has a name- it's Vicki) loves the beach, and was excited to see how Eleanor would react her first time there. 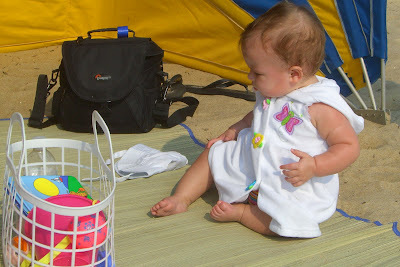 When we first arrived, we took her down to the water, and she seemed to be really interested in it. She saw a boat, and was very excited. Unfortunately, she refused to sleep in the hotel crib, so on Saturday she was a little bit of a grouch (think the Grinch on Christmas Eve). 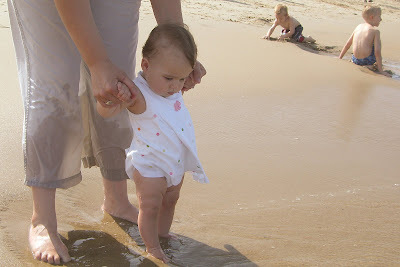 However, Vicki and I had a fabulous time playing in the ocean waves while Daddy took Eleanor back to the hotel room for a nap. Eleanor was so high maintenance that I wasn't able to get my camera out of the bag the whole weekend, so I stole these great pics from Vicki's camera. FYI...Jared is not necessarily what we would call a "beach person"...just incase you have a knack for missing the very, very obvious.